Get out of town! 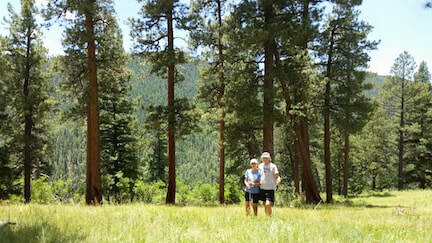 Hiking rejuvenates and restores, and lets you see a different side of New Mexico. With a variety of terrain and elevations, hiking is a year-round activity here. It's your choice: private hiking tours may be leisurely and educational, or energetic treks to surrounding peaks. Choose easier trails, or more rugged and remote areas. Trail time (exclusive of travel) may vary from 2 - 7 hours for adventures ranging from half-day jaunts to seriously full-day tours. Even a short walk can give you lots of information that you won't get from a guidebook or likely see on your own. Your Outspire hiking guide will work with you to plan the perfect hiking tour for your interests and needs. With Outspire, you dictate the pace. We take care of all the details, so you you don't have to worry about schedules or equipment. We'll provide the use of a day pack stocked with water, rain poncho, and adjustable trekking poles. Your hiking guide will carry maps, snacks, and emergency supplies. Hikers need only bring appropriate clothing, sturdy shoes, and a desire for fun! Add-ons: box lunches can make a welcome addition to longer outings. Just ask! All our hiking tours are customized and there are many more destinations available. These are only a few itineraries to give you some ideas. Don't forget to look at our "Special Tours" page also. Santa Fe spreads its low adobe walls at the foot of the Rockies' Sangre de Cristo Mountains, which step up nearly a mile above the city. Cool and green, the mountains beckon hikers to explore. The densely wooded ridges and canyons of these western slopes are laced with trails that can be reached with short drives of only 20 to 30 minutes. And the scenery is a glorious mix of conifer forest, aspen groves, and beautiful sub-alpine meadows dotted with wildflowers. In autumn the great aspen forest of Big Tesuque and Aspen Basin glows with golden light. You can choose hikes of 2 to 4 miles length, or more, depending upon your day's schedule and your party's stamina. Although you'll be hiking at high altitudes, some hikes involve little elevation gain and are delightful for families or small groups. For a greater challenge you can choose steeper paths that gain as much as 1500' and bring you to the edge of alpine tundra. But if you need a gentle, short, or simply lower-altitude walk, we can arrange that as well. You'll enjoy the characteristic mixed-conifer forest of the Southern Rockies at middle elevations, and the fragrant spruce-aspen forest higher up. Wildflowers dots streamsides and sunny meadows, changing constantly with the transition of summer into fall. Early autumn hikes catch the peak of the aspen color, but fall color persists in lower elevation canyons. Travel time: 30 minutes. Typically on trail: 2-4 hours. In the cooler months of the year, ice and snow cover the mountain trails, and so our attention turns to lower elevation hikes along the canyons, rugged escarpments, and mesas of the Rio Grande valley. Spreading views and distant blue mountains surround you on these outings. 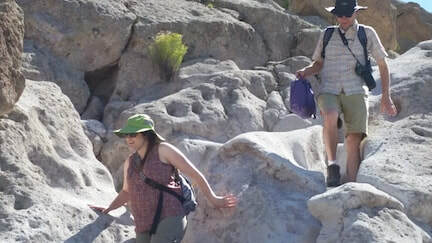 Like our summer options, we can choose among a variety of hikes of varying length and challenge, from gentle walks - short or long - to strenuous canyon descents more suitable for energetic hikers. Many of these hikes reach places of historical interest as well as natural beauty. Being more open country, the views are wonderful. Most choices will bring you a welcome solitude far from other hikers. And the winter light in New Mexico is beautiful. Travel times: 45 minutes. Typically on trail: 3-4 hours. Are you an earlybird? In Santa Fe, most museums and shops don't open until 10:00 a.m. And in our Mountain Daylight time zone you may feel like rising "early" during your visit. What to do? Earlybird adventures are private summertime 2-hour outings which will get you out on a trail custom-chosen just for you and back in town for late breakfast. Trails can be mild or slightly more challenging and you set the pace, but a hike will get your day started when the air is cool and the sky is brightening to clear blue! Enjoy a private evening walk to enjoy one of the very best places from which to view our magnificent sunsets. 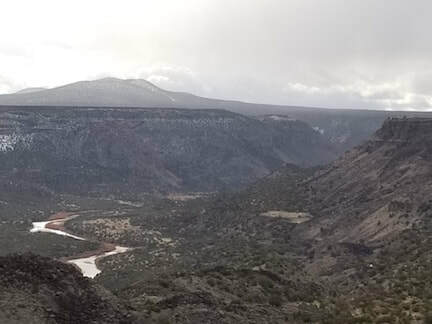 Minutes from downtown, an easy trail beckons you to stroll so you don't miss any of the marvelous views as you pass between piñon and juniper trees. We'll keep track of the time, so you arrive at the best vantage point for the sunset. Bring your camera! Travel time: 15-30 minutes Typically on trail: 1 hour. Special reduced pricing applies for this short tour; please ask. Please note : We can design an outing or workshop around a particular activity like photography, nature journalling, wildflower identification or other interest. See the About Us page for more details.